Let the Papertrey Anniversary celebrations begin! 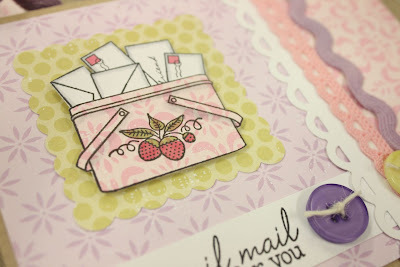 Today I have an adorable card to show you that I created using a Papertrey stamp set that Nichole and I designed together. It's near and dear to my heart and just makes me smile every time I use images from this set. For my main image, I paper pieced the picnic basket with Pine's lovely Pretty Pastels patterned paper. I then stamped on the sweet strawberries image and colored it with my Copic Sketch markers. The letters were stamped onto PTI Stamper's Select White cardstock and then colored with Copics also. 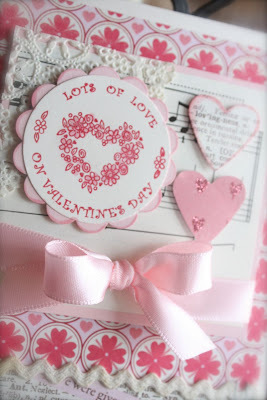 The rest of my card is also adorned with papers from the Pretty Pastels collection, Vintage Buttons and ribbon snippets from my Valentine Inspiration Station. 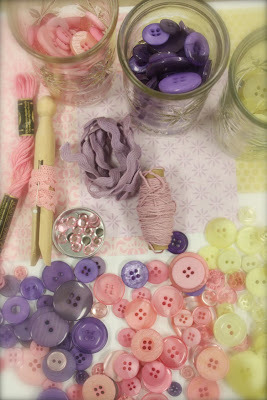 My inspiration: Using various colors of pinks and purples, I pulled Vintage Buttons, ribbons, embroidery floss, patterned papers and string from my collection. These colors are very soft and pretty...perfect for Valentine's Day, baby cards, girly cards or any projects that you want to have a soft feel. You might have noticed that I haven't mentioned the actual NAME of my favorite Papertrey stamp set, which is the only set I used in my project today. Today's anniversary contest involves you seeking out the name of each design team members favorite set as part of a scavenger hunt. You may recognize the set instantly or it may need to do a bit of research in the Papertrey store HERE. Each of the design team members have been assigned a number in accordance with their scavenger hunt order. You'll notice according to the graphic at the top of this post I am stop number 9. Create your numbered list and head over to Nichole's blog to enter to win ALL ELEVEN of the team's favorite stamp sets! Be sure not to delay, because the contest ends on February 2nd at 7am EST. The winners will be announced by noon the same day on the February Release Winners page. Have fun and good luck! JustRite is hosting the CPS sketch this week. I'm trying to do more and more of the sketch challenges because they really get the creative juices flowing. 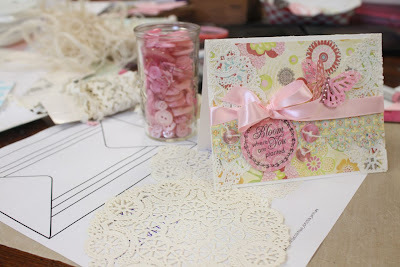 For my card, I used some background papers from K & Company and some vintage paper doilies to create the card base. My sentiment circle is made from JustRite's Seeds of Kindness set. I punched out my sentiment with a circle punch. To finish off my card, I used a pretty Sweet Blush PTI ribbon and a double layer of punched butterflies from Martha Stewart. I've got 4 rowdy girls here having a sleepover as I'm getting this post ready. By the time you read this, Chef Woody will be fixing his perfecto pancakes. I don't wanna miss out on all the fun so I'm gonna run! Have a great week everyone! Hug the ones you love...and laugh a little too. It just makes ya feel good! 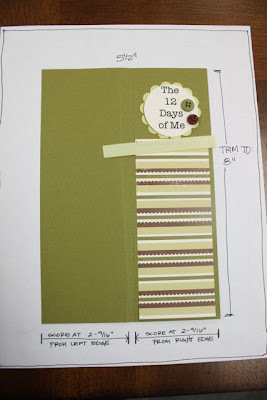 The third and final round of The 12 Days of Me kits are up in my shop now. Please take advantage now because this will be it for these kits....unless I have a huge demand for more but it would be a while til I got to them. There are 16 kits listed in the shop. Have fun with this concept!! The second round of kits are going up in my Etsy shop now so I can go watch American Idol with the family. :) Enjoy! Hello everyone. I have more 12 Days of Me kits ready to ship out this week. You can read about the concept behind my kits HERE. The kits will vary slightly from the one you see below. Some of the base cardstock is Papertrey Ripe Avocado and some of the bases will be Dark Chocolate. And some of the twill ribbon will be Spring Moss and some will be Ripe Avocado. The pieces with the numbers are now Rustic Cream. Patterned papers will be from the PTI Turning a New Leaf collection. I'm going to package them all up and mail them out randomly because it's the quickest way to package these up and get them in the mail to you. With each kit, you'll get the paper supplies, ribbon, buttons, notepad, clothespin and inserts to make one finished notepad and clothespin. All you 'll need is adhesive and twine....and a border punch and sewing machine if you want to embellish your pad like I did. Here's a look at the inside of the notepad. I have no idea why it's underling as I type...so if it shows up that way...who knows. And here are some very basic sketches for you on how to assemble your notebook. It's pretty easy to do just by looking at the photo but these sketches provide you with a few visuals. 2. 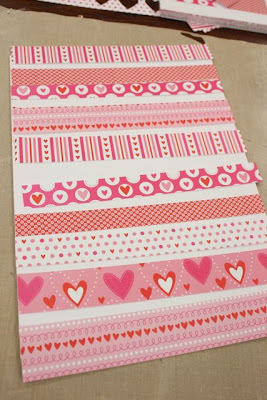 Trim patterned paper to 2-5/16" x 5-1/2". 3. Trim the numbers piece to the desired with you'll need to leave an appropriate amount left over for punching. You'll have to test this on a scrap piece first because it will depend on what border punch you use. Sew along the left side of the numbers piece, if desired. 4. Trim base cardstock (it will either be Ripe Avocado or Dark Chocolate) to 5-1/2" x 8". 5. Score in from the left edge at 2-9/16". 6. Score in from the right edge at 2-9/16". Fold up notebook base. Adhere notebook to inside at this point (I use Scor-Tape for this). 7. Adhere patterned paper piece and scalloped circle piece to the front of notebook. Any adhesive will work for this. 8. Adhere twill ribbon to front of notebook(I use Scor-Tape for this). Trim edges. 10. The 12 printed sheets just slide in the notebook and are loose. I use a small binder clip to hold mine in. A paper clip would work fine too. 11. 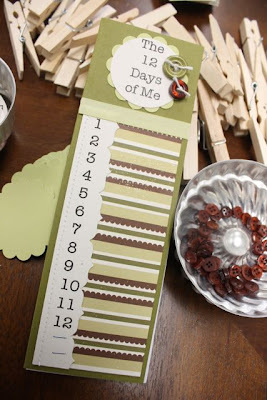 Adhere *It's My Day* piece and button to clothespin. Again, use twine or string in the button if desired. I use Scor-Tape to adhere the cardstock piece to the clothespin. The first round of 10 kits will be going up in my Etsy shop shortly. The next round will go up at approximately 7:00pm Central Time. Have you planned any personal days? I'd love to hear about them and what you're planning for your day! I'm working on my February day and will post about that closer to my personal day...February 19th. :) Enjoy! 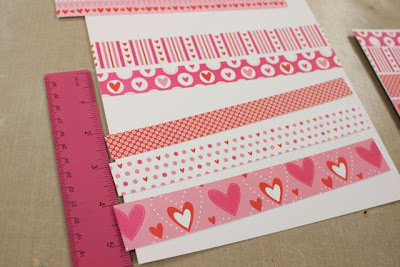 Today I have a pretty little Valentine card to show you using JustRite's Favorite Occasions Borders & Centers stamp set(which works with the 1-5/8" or 2" stampers). I love images that I can punch out with my circle punches. They make such quick and easy accents for cards. I paired this pretty little flowery heart and sentiment up with punched hearts from Making Memories' new Valentine line that I got at Archiver's. My accent piece is decked out with a piece of vintage paper doily, old sheet music and a pretty tied ribbon. Background papers are also from Making Memories. Stapler is Tiny Tim's....well, it's from Tim Holtz but I call it Tiny Tim. I love those little staples! I found mine at my local scrapbook store. Hope you enjoy my card!! I'm off to gather some wood before it all gets covered with snow. Let's revert back to one of my favorite characters, Mary Ingalls Wilder. Pa wants some wood carried in so I'm gonna go put on my britches and wheelbarrow some up to our little house on the prairie. All the little ones are at school so I reckon I'll have to fetch it all by myself. You're getting a visual, eh? Good morning everyone! It's a new day and I have lots of fun work to do. Isn't it nice to use fun and work it the same sentence? I have a great job! I'm working on more 12 Days of Me kits today and hopefully I'll get them into my shop yet today too. I'm going to post them in sets of 10 at various times of the day in hopes that everyone can get a shot at them. I know the time zones and work schedules have prevented many of you from getting one. Hopefully the staggered times will help you out. For the question about my photos below. Yes, I used a photo editing feature on my new IMac that blurs the background/edges of photos. Pretty snazzy huh? Gives a soft, romantic feel to photos. Have a great day everyone...and as always, thank you for visiting me. I saw a stamping friend, Maggie, at the girls' ballgame the other day. She said she starts her day with me every morning. I know a lot of you grab a cup of coffee and settle in with the blogs. I am so glad you visit me, I really really appreciate all of you wonderful, crazy ladies! Good morning Maggie! Hello friends. I am back from the dentist and survived. Fun...no. Done....yes. Woohoo! 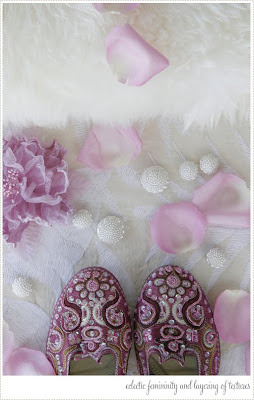 The sweet Melissa Phillips has a beautiful photo for her fun Inspirational Photo challenge on her blog today. It is so soft and serene. Her photo comes from A Creative Mint blog. What a great new source for inspiration! Here's my card I made using the photo for inspiration. I used the sweet new papers from Papertrey called Pretty Pastels. The Shimmery White cardstock is accented with that great purple sheet music I rescued from the music shop where Jordy takes guitar lessons. 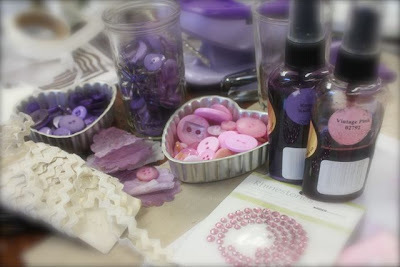 Vintage Buttons in purples and pinks were plucked right from my Valentine Inspiration Station. 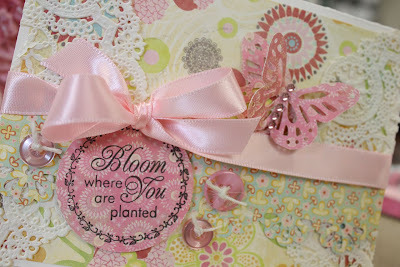 Sentiment and background on shimmer cardstock is from Giga Guidelines. Base cardstock is Lavender Moon. Here's a pretty assortment of items I pulled from my Valentine stash. Ahhhh, so pretty to look at. 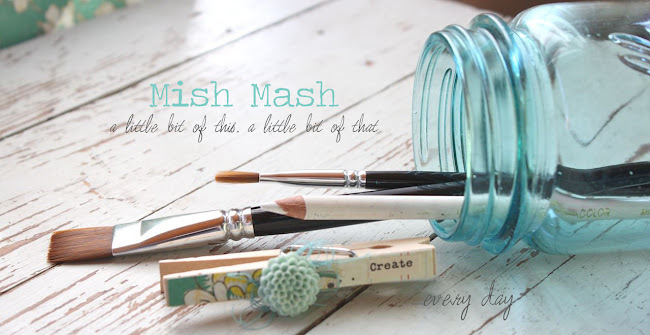 Be sure to check out Melissa's blog for more links and more fun projecst by more awesome friends! Thanks for the challenge Melissa. These are fun and inspiring! 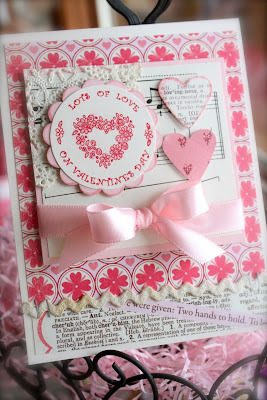 I have another Valentine card today to show you using Karen Lockhart's new Cupcake with Sprinkles stamp. 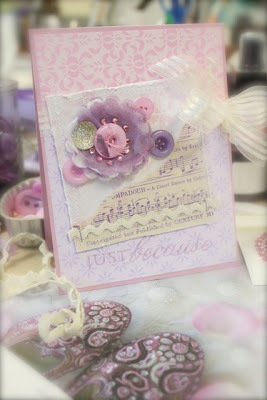 I used more papers from Making Memories for the base of my card and for the main image focal piece. I colored my cupcake with Copic Sketch markers, using the gray (t) colors to tone down the brown on the cupcake liner. I glittered the hearts on the cupcakes too. 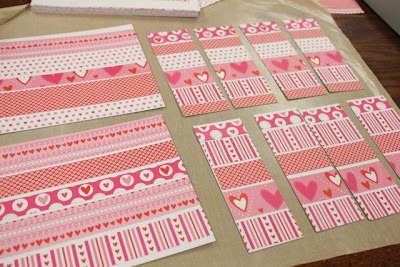 The inside of my card is embellished with scraps of the patterned paper and a Valentine sentiment from Papertrey Ink. February will be here before we know it. Do you have any special plans for Valentine's Day this year? I'm looking for fun ideas for a family night......a special dinner menu, maybe some games and little gifts. I would love to hear of any special traditions or fun new ideas you have. Edit: A few of my links weren't working but I've got them fixed now. Sorry about that, total user error here on my new Mac. And to answer a question about the ribbon on my card. I used Scor-Tape to adhere the ribbon...and just snip off the ends. They don't wrap around. Hope that helps. Oh, and I have to go back to the dreaded dentist tomorrow for a 2 hour appt. I think I had a mini panic attack on the way to town this morning. Tomorrow will be a major deal for me...I am just a dentist wimp! If you're like me, sometimes you need a little change of pace when working on projects. I usually have no problems coming up with my own card layouts but sometimes it's just nice to do something a little different....try something new. Sketches are a great way to mix things up a bit. This week, JustRite is sponsoring the 2 Sketches 4 U weekly sketch. Check out the 2 Sketches 4 U website to see the weekly sketch and play along. It's a very simple sketch and very easy to use with JustRite's 2" squares. For my card, I used patterned paper from Bo Bunny, Sweet Blush Cardstock from PTI, pink rhinestones, Sweet Blush PTI Vintage Buttons and embroidery thread. For the main image I used JustRite's 2" Decorative Square Frame and a sentiment from the Romantic Sentiments Centers Round set. 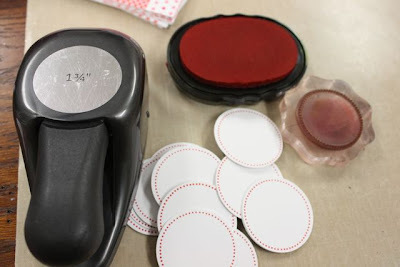 These round sentiment stamps fit right inside the square frames, making it easy to stamp both images at one time. Hope you enjoy! I'm out the door for a busy day. First thing is to see how my brother is doing. Thank you for all your thoughts and prayers. Next, I have a severely dreaded dentist appointment. I cracked a tooth that had a large filling in it. Enough said, you know what comes next.....the drill, that smell, people's fingers in my mouth. Ick. Then in the afternoon, it's back to town for Josey's MRI. Finally time to see what's going on in her shoulder. I'm praying she doesn't need surgery but that we can figure out what to do to stop the pain when she plays sports. Okay, I better run. Have a great week everyone! 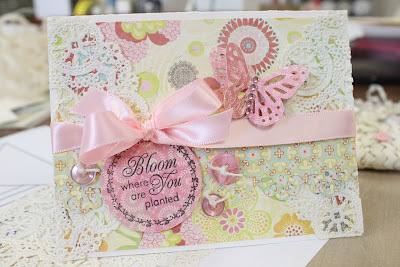 One of Karen Lockhart's specialities is her darling angel stamps. Her new Valentine Angel is sweet as can be. I colored the Valentine Angel with Copic Sketch markers. I always like to color the angels with red hair. I colored the rest of the image to match the patterned papers. By Bo Bunny, I think. I used a Spellbinder's die to cut out my image. 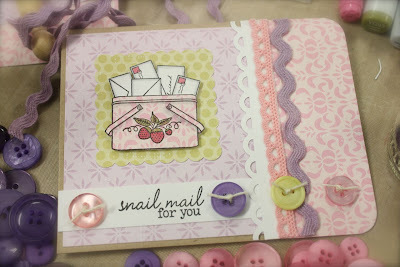 The background and sentiment stamps are from Pine's Simple Valentine stamp set from PTI. I hope you're having a great weekend. My brother went back to the hospital yesterday with heart complications. He suffered a heart attack last fall so we're always very worried about him. He should be home today but will need some major bypass surgery in the future. It's times like these that always make you take a step back to look at what you're really thankful for. I just wanted to let you all know that your kind comments are always appreciated so much. It's so nice to come back to a post and see that you've left some comment love. Thank you so much, my friends. Edit: Thanks for your help everyone, I have secured a Simon and it will be sent to me soon. Nick will be so happy!! My sweet little nephew Nicholas called me the other day and said *Helllooooo Gorgeous!*. Apparently that's what one of the chipmunks says in the new Chipmunks Squeakqual movie. He's collected all of the little chipmunks from McDonald's Happy Meals....except for Simon. I checked out McDonald's and they're out. Bummer. I would love to surprise Nick with a Simon. If you have one or can find one at a McDonald's near you I would gladly pay for the cost of the Happy Meal and shipping to me. Just post a comment with your contact information if you have one. I will be THRILLED if I can find one. Thanks guys! At a recent trip to Archivers I headed straight for the Making Memories display. It's my favorite part about Archivers that I always look forward to. I wasn't disappointed when I found the new Valentine items. I purchased several sheets of patterned paper, including this collage sheet below. It has great images that can be cut up to use on projects. And that's just what I did for my Valentine card below. I paired a cut image from the patterned paper with Karen Lockhart's new Cupcake With Sprinkles stamp. A perfect combo, just like cupcakes and frosting. While at that link above, you can see all of Karen's new releases on her homepage. I colored my cupcake image using the Copic Sketch markers shown at the end of this post. A little glitter makes the cupcake extra special. If you want to cut out stamped images to use on projects like I did, here's a little tip for you: Leave a white border around your image when you cut. It makes it look like a store bought embellishment, very cool. The rest of my card was embellished with more Making Memories patterned paper, pink rhinestones, Papertrey Kraft cardstock and Papertrey Scarlet Jewel Luxe Satin ribbon. Hope you enjoy my card today! Have a great weekend everyone. Hey everyone! Thanks for stopping by today. I have a very cool project to show you today. If you're looking for some little goodies to make for Valentine's Day then you're in luck. 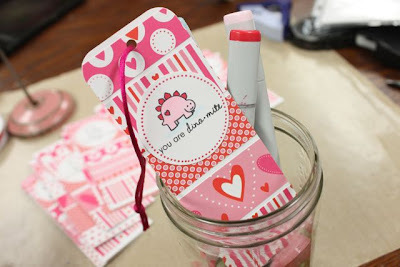 My project is cute, simple and you can even let the kids in on the fun. 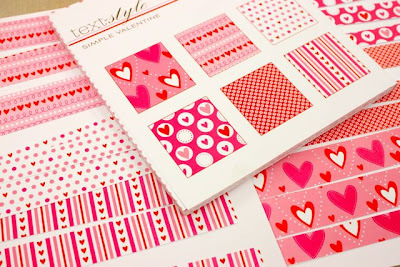 It all starts with Papertrey's Simple Valentine patterned paper and Stamper's Select White Cardstock. I'm working with two sheets of 8.5" x 11" white cardstock today but you can use just one or as many as you like. Cut the white cardstock to 8" x 11". Then cut strips from the 8" x 8", approximately 1".......but make some narrower and some wider. It doesn't matter and you don't really need to measure. 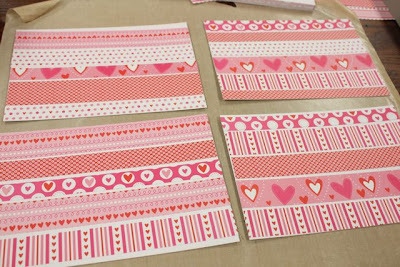 Just start cutting strips from each pattern. You'll need about 20 strips. 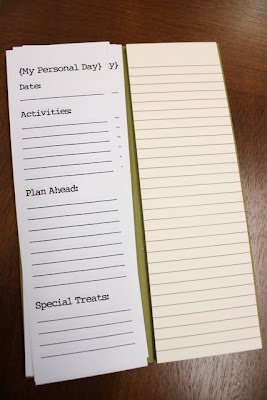 Arrange the strips on the white cardstock in an alternating layout. We're just getting the design here, don't adhere anything just yet. Next up, we're going to adhere the strips. I'll explain the reasoning later, but start adhering the strips at 5-1/2", the center of the 11" length of the white paper. 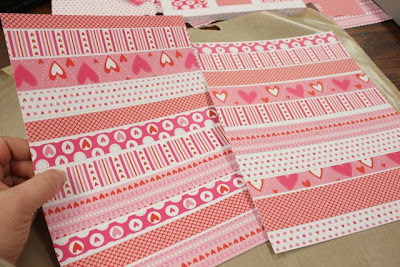 Just lay down a ruler and adhere the first two strips of patterned paper, leaving about an 1/8" gap at that 5-1/2" measurement. Don't get all worried because you have to get a ruler out. This is so easy. Now you can go crazy and just adhere more strips until the white cardstock is covered. I left approximately an 1/8" gap between the papers. Don't measure and don't worry if the strips are a little crooked. That's the look we're aiming for. 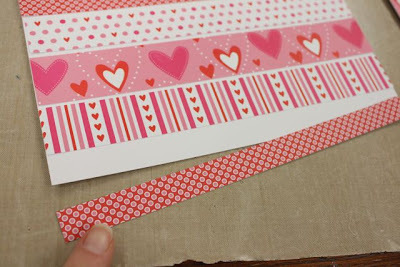 You will want to use adhesive on the entire strip of patterned paper so it will stick well all over. 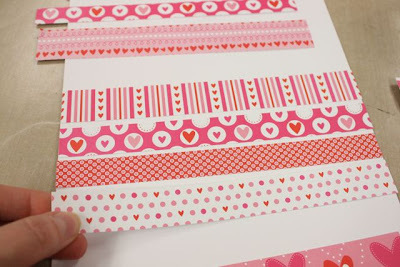 When you get to the ends of the white cardstock, you may have to trim down those last pieces of patterned paper to fit. 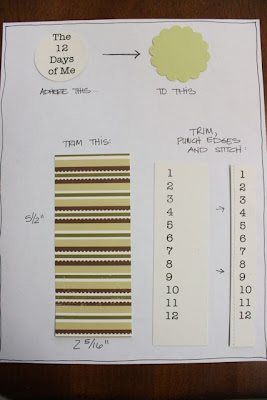 Don't measure......just adhere the paper and trim it off with your paper trimmer or scissors. 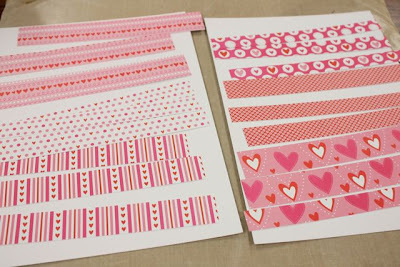 When you're done adhering the strips, you'll get full sheets of cardstock full of patterned paper strips. Very cute, huh? But we're not done. Next up, we're going to cut the paper in half at that 5-1/2" mark. That's why we left that gap...so that we didn't end up with little tiny slivers of patterned paper at our cut line. I'm always thinking...just for you. Now we want to cut those pieces into 2" strips. The wheels are turning now aren't they as you develop a mental picture of what's to come? Exciting, isn't it? Next we want to make some cute circle accents. Use the dotted circle from Take Note to stamp Pure Poppy circles. Punch out with the 1-3/4" circle punch. If you use 2 sheets of cardstock for the above steps, you'll need 16 circles. 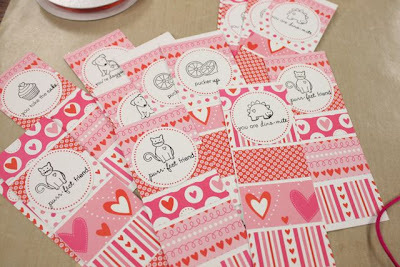 Stamp the circles with cute Valentine images from Tiny Treats: Valentines. Be sure to use an ink that is compatible with coloring with Copic markers. I use the Palette Black Noir ink pad. At this point, you can color all the images........have your kids color the images......or do what I have done and adhere the images to the bookmarks uncolored. I'm going to let the girls color the images or perhaps the girls will just let their friends color their own images. The choice is up to you. Are these cute or what?????? 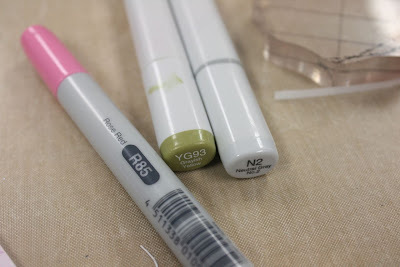 I chose just a few Copic Sketch markers, shown below, for my girls to use. Limiting choices for the kiddos simplifies the process. I would definitely let kids that are the ages of my girls use my Copics. But if you have younger kids, you might want to hide your Copics. Have you been in a room full of Kindergartners lately? Just sayin'. If you want to add a little fancy schmancy look to your bookmarks, you can do a few more steps like I've done below. I rounded the top corners of a bookmark with a corner rounder punch.....then punched a hole with my Crop-a-Dile......then added some thick string I've had in my stash for a while. (from Michael's). I also colored the cute dinosaur image using the Copic colors shown in the photo above. Isn't this just the most fun idea you've seen today? It's so simple...the one sheet wonder idea just steam lines the entire process. I think I'm going to make up some of these in papers that the high school kids would like too......my librarian friend is always needing new bookmarks. Soooooooooo............go ahead and tell me what you think? Do you love? I hope you do. Edit: The divided page protectors that I use are from We R Memory Keepers. I purchase mine at my local scrapbook store and Archiver's. If you want to purchase online, just use your search engine to find a website that carries them. For the 6 x 12 pages...and any of the smaller sizes like 8.5 x 11 or 8 x 8....I blend them right in with my large 12 x 12 scrapbooks. I use the WeR brand of scrapbooks too and the pages all tuck nicely inside when closed, no pages hang over the edges. Hope that helps. Hey everyone! I've added some photos of my personal day for you. Here I am gettin' all scrappy with my supplies. No need to zoom in.......there's only wrinkles and chubby cheeks. I did two detailed page spreads of our Christmas events at the grandparents' houses. And the rest of my layouts were much simpler, using the divided page protectors. 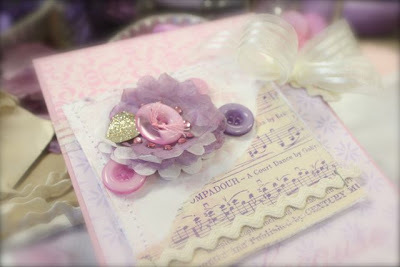 I love this method of blended scrapbooking, so much faster! And here's the recipe for the Turkey Bacon Rollups. Using a big tortilla (I think mine were jalapeno something), spread on a little bit of herbed cream cheese. I used herb flavored Alouette cheese spread. Layer on turkey slices and any kind of shredded cheese. Microwave this for about a minute, til the cheese is nice and melted. Have cooked bacon ready and I even softened up some red onion I had in the frig. Add the bacon and onions to the wrap and roll up tightly. Cut in half and secure with toothpicks. This makes a big wrap, I only ate half of it and saved the other half for supper. I like to dip mine in my homemade salsa or honey mustard. And it's good to slug it down with a diet pop. Enjoy!! I'm back, good morning everyone! 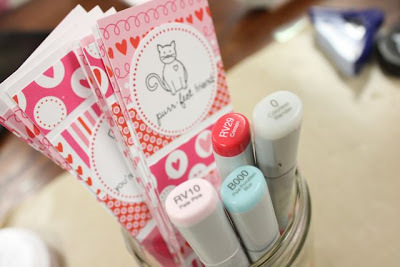 Be sure to scroll down for my first post today showing you how to use Papertrey's Creatively Clear Cardstock and Copic markers. You won't want to miss it. Today is the 19th, which marks the first day of my 12 Days of Me concept. You can read all about it HERE. I've taken the day off to do something totally personal for me. My very own personal day to do whatever I want. This hardly ever happens but I'm doin' it! Check back throughout the day as I pop in and out to tell you about my day. And in case you're wondering, I am slowly getting my computer/printer issues figured out....so I'll have the next 40 kits of The 12 Days of Me in my Etsy shop very soon....this week. I'll post a notice here on the blog for when the kits will go up. 9:24 am...2 page layout done of Christmas at my folks and the inlaws. woohoo. 10:23am....used divided scrapbook pages for 3 pages of photos, so quick and easy. nothing fancy but I'm getting it done. i need a snack. 11:50am...taking a break for lunch and Diet Wild Cherry Pepsi. Yummo. "I certainly hope today's posting includes turkey bacon rolls (yes, I am still here - did you think I would forget)." Oh Dear Kimberly Ann, how could I forget you? YES, I am enjoying a turkey bacon rollup with honey mustard dip. And I took photos. And I'll be posting the recipe for you too. Sometime later. 1:36pm...finishing up a billion photos I took of sledding. divided page protectors to the rescue again. time for a nice hot cup of coffee. i want to make sure i have time to clean up my mess today. watching bobby flay on the big tv. 5:01pm...finished all my holiday pages. i think i may have lost thanksgiving photo with my computer crash. dang. the girls are home early now since BB season is over but they're entertaining themselves. just finishing up an altered 25 days of christmas mini altered album. i decided to nip the daily december idea and just the album for photos of christmas gifts, extra photos and christmas card/photos we received from friends. thought: someone asked what's for supper........i haven't thought about it but maybe french toast and leftover bacon from my lunch. i've had such a great day. 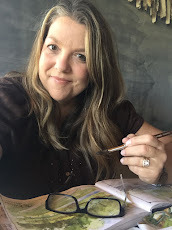 i'll share my thoughts tomorrow about my personal day and how i want to approach scrapbooking now. 8:33pm...watched American Idol while finishing up my projects. i did it! Christmas/winter pages are all done for 2009. i have about 4 more layouts to complete 2009. my 365 album is complete for 2009 too. feels so good to accomplish this. so good to commit.......my word for the year, commit.